Being social is an essential part of life. Humans are social creatures with an emotional need for relationships and connections with others. Our social connections not only give us happiness, but they can also influence our mental and physical wellbeing. Meaningful relationships can act as a psychological buffer against stress, and people who have them have been shown to be happier, have fewer health issues, and even live longer lives. By contrast, there is evidence that being socially isolated can lead to depression, illness, or a reduced lifespan. Yikes! 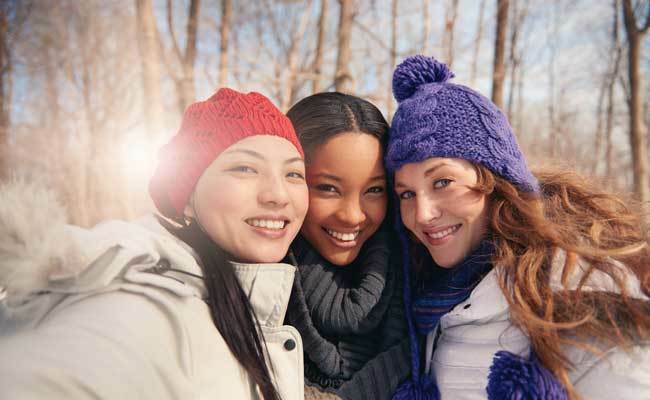 Although staying socially active and maintaining relationships is an important part of life, it can be challenging to do so, especially in the dead of winter when the temperatures are freezing. Here are seven ways to help you stay social during winter, and for some of them you won’t even need to leave the house. Sharing and enjoying food together is a basic expression of friendship and community. In her book, Eating Together, sociologist Alice Julier believes that dining together can radically shift people’s perspectives: Sharing food together reduces people’s perceptions of inequality, and they then tend to view those of different races, genders, and socioeconomic backgrounds as more equal than they would have in other social situations. However, sharing a meal together doesn’t mean you have to go out to a restaurant or cafe. Do you like to cook or bake? Find a few recipes you’d like to try and invite a friend or two over to help prepare them. Host your friends or family for brunch or get creative and try a themed dinner party. Or, if cooking isn’t your thing, try throwing a community potluck and ask others to bring a dish along to share. Aside from the enjoyment and relaxation that hobbies add to our lives, hobbies can also be a great way to be more social. While some hobbies are solitary, many can get us out and into our communities, meeting people, sharing interests, and strengthening bonds that are already there or forming new ones. Check out your local community center, town recreation center, or public library for activities to join. Start a hobby club with a group of friends and schedule a time to meet. There are many who need help. Doing something that helps others can be a positive experience for both you and the people you’re helping. Find a cause you’re passionate about, gather a group of your favorite people who share your passion, and make volunteering your new group activity. Whether you live in a big city or a smaller town, I bet there’s a place or two you haven’t visited yet. It’s easy to get in the habit of visiting the same places over and over again, especially indoor attractions ignored during warmer months. Instead, make a list of all the attractions and activities in your area and partner up with a friend or two. Make it a game to see how many places you can visit in the span of one winter. Let’s be honest, for some of us working out isn’t fun or enjoyable but perhaps that’s because we’re not working out with our friends. Try joining a gym or fitness class with friends to get you physically and socially active. If you can’t afford a gym, start a fitness club with your friends. Every week, pick a new exercise video and invite a group of friends over to work out with you. Protip: Save money by checking your local library for copies of fitness titles. If you’re anything like me, leaving the house in freezing temperatures isn’t all that appealing. I know this is obvious but, if you don’t want to go to see people, then bring the people in your house to see you. Organize a game night, a movie night, a clothing swap, a wine night, or relive your childhood with a fun adult sleep-over. Depending on where you live, going outdoors may not be possible. But for those who live where it is, there are a lot of fun outdoor activities that can help keep us social. First things first, get yourself some warm and comfortable winter gear. Doing so will significantly increase your enjoyment of any wintertime activity. Grab some friends and go hiking, skiing, sled riding, ice skating, or grab a few pairs of binoculars and spend some quality time winter bird watching. Now it’s your turn to share! Tell me how you stay social (and warm) in cold winter months in the comments!